The skull-bashing 2nd full-length from this Greek commando. Hailing from Athens, the band was formed in 2012 by a bunch of ridiculously young lads that felt an overwhelming urge to return to the sound of the old Thrash Metal and Thrash/Death Metal acts of the late 80's / early 90's. After two demos, the band saw their critically acclaimed debut album, "Crimes Against Humanity", released on Witches Brew in 2015, followed up by the self-financed "Total Madness Reigns" EP in 2016. Both releases allowed them to play a good number of shows and festivals all over Greece, sharing the stage with some of the best bands of the Greek underground scene, as well as opening for some international acts such as Sodom and Vektor. Prior to the release of their sophomore album on Memento Mori, they were featured on the "Preachers of the Fallen Fate" split w/ Toxic Carnage, released by Hellforced Records and Chainsaw Distro. We at Memento Mori don´t usually get impressed by current Thrash Metal acts. But the day these young guys sent us two demo songs recorded live at the rehearsal room, we sure as hell knew we wanted Rapture aboard at any cost, for they manage to hit all the right spots. No trace of dumb melodies and no sign of compromise: it's all about aggressive, frantic and organic Thrash/Death Metal with catchy, heavy and headbang-inducing breaks that keep the whole listening process really interesting and dynamic. 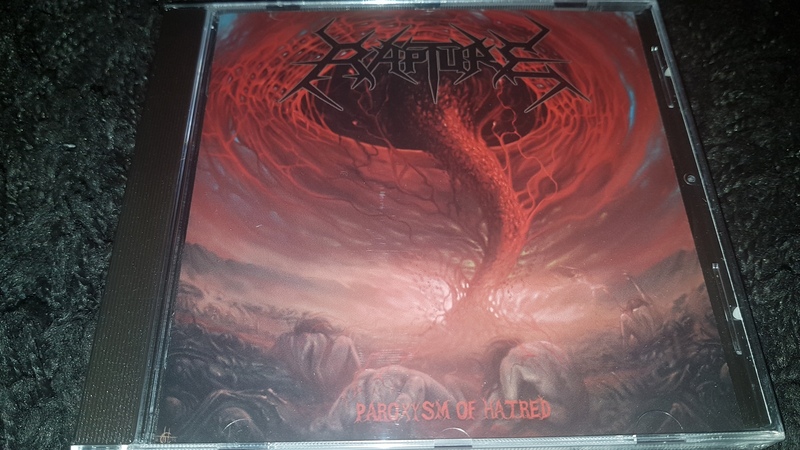 Heavily influenced by Dark Angel, Demolition Hammer, early Death, Sadus, Slayer, Merciless, Protector, Rigor Mortis, Massacra, Sepultura, Destruction, Num Skull, early Pestilence and Sodom, "Paroxysm of Hatred" is no re-inventing of the wheel. But we don't really need no forward-thinking crap in our Thrash Metal. We just want it loud, fierce, violent, pounding, organic and technically competent, and that's exactly what these maniacs have on offer. Engineered by Haris Vougiatzis (of War Possession / Embrace of Thorns fame) at his own Eleventh Tower Studios, and sporting a terrific cover art by the talented illustrator / tattoo artist known as Chaostouched, "Paroxysm of Hatred" is the most exciting album in the style the world has witnessed in recent times, and it´ll definitely whip up a storm of feelings in even the most hardened scenesters!